EU leaders agreed in June to open accession talks with Albania in 2019, subject to the country making sufficient progress on judicial and anti-corruption reforms. Andi Hoxhaj assesses where Albania now stands and what the priorities will be over the next year as the country seeks to demonstrate tangible results to its EU partners. 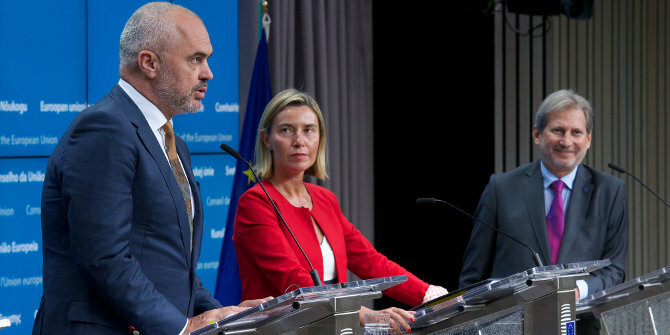 In June, the European Council recognised that Albania had made steady progress in five key areas that are required before EU accession talks can begin: advancing public administration reforms; the protection of human rights; the battle against corruption; tackling organised crime; and implementing judicial reforms. The conditions that the Council has now set out for Albania focus heavily on further judicial reforms, notably the ‘vetting process’ for re-evaluating judges and prosecutors. They also call for the finalising of specialised bodies, including the Special Anti-Corruption and Organised Crime Structure (SPAK) and National Bureau of Investigation (NBI), which will assist in the fight against corruption and organised crime. More importantly, the Council has called on Albania to establish a track record of proactive investigations, prosecutions and convictions in corruption and organised crime cases involving high level public officials – which was among the main concerns voiced by the Netherlands and France. These conditions are not new. The EU Enlargement 2018 Progress Report on Albania, issued in April this year, also raised concerns about corruption and the low conviction rate for high‑ranking officials. The EU Ambassador to Albania, Romana Vlahutin, when asked for this article, indicated that ‘there are no new conditions, these are all very well-known items, and what is expected from Albania is to further deepen and strengthen the implementation of the reforms’. Corruption continues to be a serious problem for Albania and in 2017 the country did not make significant progress in fighting against grand corruption. The Freedom House 2018 Country Report for Albania issued in April this year found that the progress made in 2017 to reduce petty corruption was offset by lost ground in the fight against grand corruption. Furthermore, the number of final convictions in organised crime cases remains very low and has only slightly increased in the last year. A study conducted by Fabian Zhilla highlights the extent to which organised crime networks are highly active in Albania and the European Union, and have strong links with major political parties. Therefore, there is genuine cause for concern from the Member States over the lack of a track record in fighting corruption and organised crime at the highest level. In regard to Albania’s judicial reforms, the reassessment of judiciary officials only began in November 2017 and will include 800 judges and prosecutors, as well as a number of other members of the judiciary. So far it is delivering its first tangible results: Romana Vlahutin indicated when asked for this article that ‘Albania has embarked on some really bold reforms’, noting that ‘it is not easy of course, vested interests try to strike back, but we are certain that this trajectory is clearly oriented towards progress’. Therefore, Albania is showing that it is possible to establish some confidence in the rule of law in a formerly brutal totalitarian state – but this process is still in an early phase and it will need the EU to protect Albania’s judiciary reforms until full implementation can be achieved. The decision of the EU to open accession talks with Albania has received generally positive responses. When I asked Ditmir Bushati, the Albanian Minister of Foreign Affairs, for a comment for this article, he welcomed the decision by saying that: “Our work ahead, in the next year, will focus on two interlinked processes: first, the deepening of reforms in the five key priorities so that the Commission’s report re-confirms the recommendation for the opening of negotiations, and second, the setting up of negotiating structures and the strengthening of the existing EU integration units in the line ministries and within the Ministry for Europe and Foreign Affairs’. EU integration has become an important part of the social contract that the Albanian political system has established with its citizens in the post-communist period, and 80 per cent of the public, according to the 2018 Balkan Public Barometer, support the EU integration process. Furthermore, making progress towards the EU conditions has been an important indicator of the government’s performance in reforming and transforming the country to be in line with European standards. There is therefore great pressure on Albania to deliver over the next year on the conditions that the EU has stressed. In Romana Vlahutin’s words, ‘Albania lost most of the 20th century to a terrible communist dictatorship and a chaotic transition in the 1990s. So the opening of the accession talks to Albania means anchoring the country firmly to the European core but is also the best possible instrument for further modernisation’. Although Albania has made progress through structural reforms to bring the country closer to European standards, the country’s political parties have yet to fully deliver on the political criteria that the EU Commission has called upon in many of its past progress reports. This is imperative for the country’s political stability, which still remains fairly fragile – as shown, for instance, by a long opposition boycott of parliamentary proceedings and the lack of cross-party political dialogue. This will be tested next year as Albania will hold local elections in spring 2019. The elections will be a key test for Albanian democratic institutions, values and political culture, which are some of the fundamental elements of the European integration process. The EU Council in its conclusion underlined that Albania needs to address outstanding OSCE-ODIHR recommendations on electoral reform. Key tests will be whether Albania succeeds in tackling persistent issues of vote-buying, depoliticising and increasing women’s participation in the country’s electoral administration, and eliminating unreasonable restrictions on voter rights to strengthen public confidence in the electoral process. As Romana Vlahutin highlights, ‘the EU Council has also made a reference to the electoral reform along the almost decades long OSCE-ODIHR recommendations, and we expect progress in that as well’. Formally opening negotiations in 2019 will not necessarily mean Albania will be set on an inevitable path toward EU accession. But in the next year, Albania must emerge in a stronger position and show credible and tangible progress in the fight against high-level corruption and organised crime, while fully implementing its ongoing judicial reforms. The country will also need to demonstrate the necessary political will to implement the outstanding electoral recommendations and increase public confidence in a democratic process that still remains fragile.